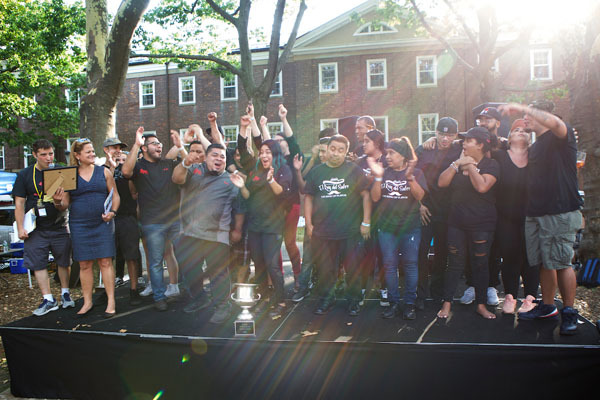 Called the “Oscars of Street Food”, the Vendy Awards is an annual street food competition and fundraiser for the Street Vendor Project, a non-profit organization that provides legal representation and advocacy for street vendors. New York, NY – September 16, 2017: The 13th Annual Vendy Awards, hosted by the Street Vendors Project, took place on Governors Island. 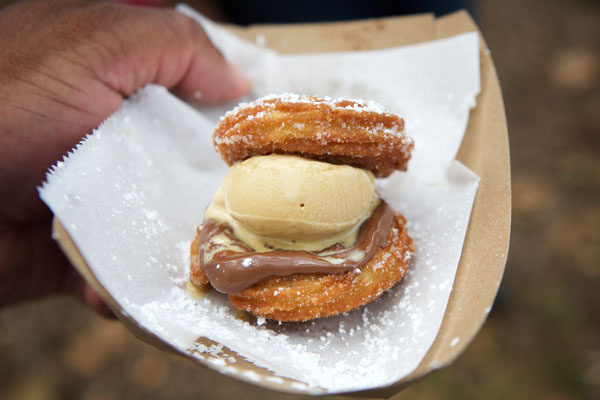 The NYC Vendy Awards is a food competition and a beloved weekend event, giving attendees the opportunity to sample bites from the cream of the crop of NYC’s thousands of street food vendors. Many of NYC’s most famous trucks got their first big boost at the Vendys, and this year will be no exception. Over 25 vendors are selected by public nomination, and the winners are chosen by attendees and our celebrity judges, (which will be announced later this week). This year’s categories are: Bad Hombres for best taco truck, Rookie for the best new truck or cart, best Dessert, best in Market for the many eclectic food market vendors, and the coveted Vendy Cup Award for the best overall vendor. 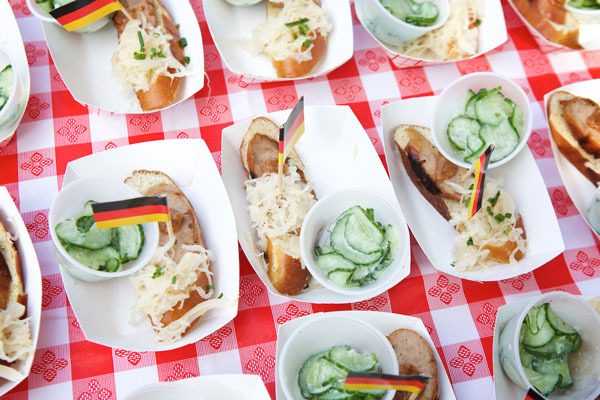 For the thousands of people who attend the event each year, The Vendys offer the unique experience of tasting New York’s best street food—tastes from around the world—in one spectacular venue without breaking the bank or busting a gut. The finalists for this year’s Vendys have been announced in all categories but the Vendy Cup which he operates alongside his son and nieces and nephews. o Maria Palacios; Yolanda’s Tamales is owned by Maria Palacio, who was born in Guerrero Mexico and immigrated to the US when she was 23. After working a short time in a supermarket, she opened up the first tamale cart on Upper Broadway, using recipes taught by her grandmother, Yolanda. She set up near 137th Street, where her tamales became famous among City College students, and has since moved up to 145th Street. In previous years, the winners have gone on to glory! The 2016 winner Tacos el Rancho led the pack and will return to present this year’s Vendy Cup Winner! Maria Palacios; Yolanda’s Tamales is owned by Maria Palacio, who was born in Guerrero Mexico and immigrated to the US when she was 23. After working a short time in a supermarket, she opened up the first tamale cart on Upper Broadway, using recipes taught by her grandmother, Yolanda. She set up near 137th Street, where her tamales became famous among City College students, and has since moved up to 145th Street. Godshelter Oluwalogbon; DF Nigerian is run by Godshelter Oluwalogbon and his wife Bisola. He started catering for members of his church, in East New York, Brooklyn. After ten years of catering, he started selling meals out of the back of his car outside the Nigerian embassy in midtown. Two years ago, he opened DF Nigerian food truck, and recently signed a lease on a restaurant. 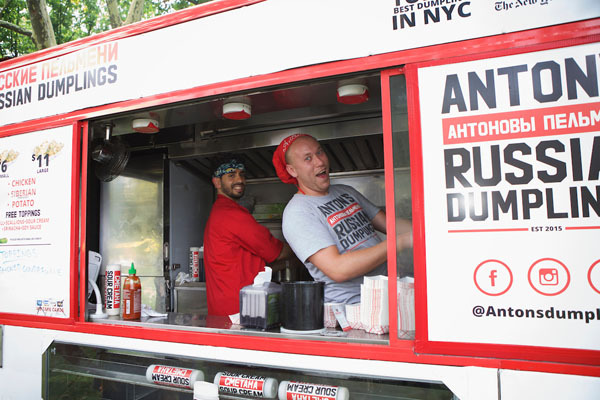 Anton Yelyashkevich; Anton’s Dumplings specializes in pelmeni, which are Russian-style dumplings wrapped in thin, unleaven dough. It was founded by Anton Yelyashkevich, who immigrated to the US from Belarus in 1996, with his family, at the age of 6. He grew up in Bensonhurst, went to art school, worked in advertising and then founded his cart in 2015 near the basketball courts on West Fourth Street. After a glowing write-up in the NY Times, business took off, and he is now looking for a permit to expand his business. Ji Chen “Peter” Wang; Owns Big Brother’s Delicious Food is known for selling Chinese- style barbecue skewers on Main Street in downtown Flushing. He now has two carts, which he operates alongside his son and nieces and nephews. 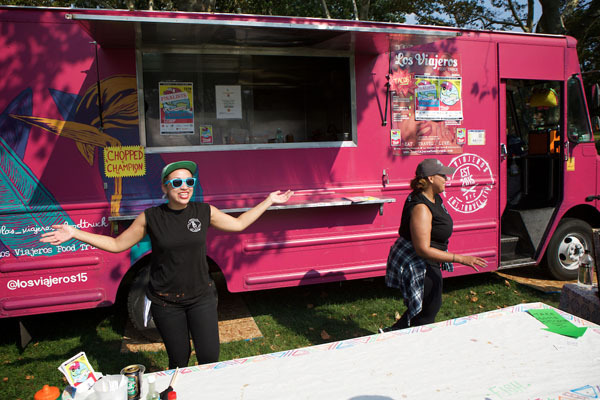 DF Nigerian, a midtown Manhattan food truck run by Godshelter Oluwalogbon and his wife, Bisola, took home the city’s top street food prize today the 13th Annual Vendy Awards on Governor’s Island. 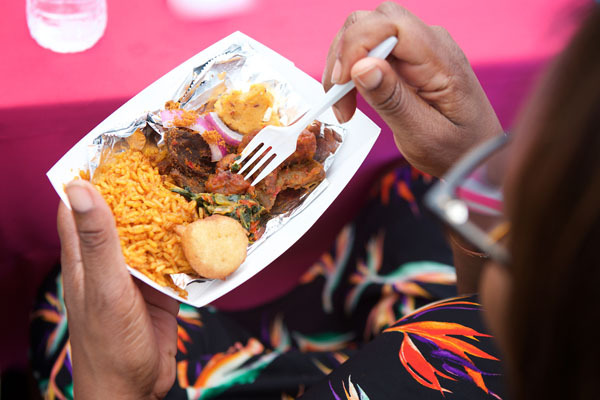 Oluwalogbon, who immigrated to the US in 2001 and got his start vending food out of the trunk of his car parked outside the Nigerian embassy, won top honors for his jolof rice, peppered goat stew, efo riro, puff puff, moi moi, and suya.